Vivo Nex, a phone comes with a real full screen display(no notch) is available for pre-Order at Amazon India. The phone have a very new idea of selfie/front facing camera, it pop-up when required. The company claims it will be ready with in one second. 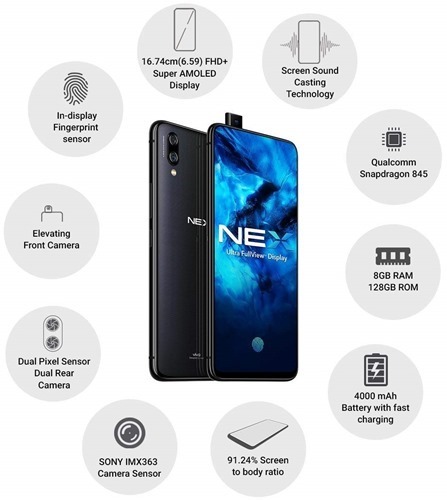 This mobile phone comes with a Qualcomm Snapdragon 845, 8GB of RAM and 128GB of Internal Memory. Vivo Nex have a dual rear camera with Sony IMX363 sensor where one is with 12 Mega pixel and other with 5. 6.59 inch Full HD+ Super Amoled Display with 2316 x 1080 pixels resolution, it also have an in display fingerprint sensor and Screen Sound casting that is the display will function like a speaker and an earpiece. It can support 2 Nano SIMs at a time, both slots supports 4G. The phone comes with a pre-applied screen protector. Assured buy back worth Rs. 22,495. Get ₹1950 cashback and Free Premium Security Subscription of Jio Data (39 vouchers of Rs. 50/-).